Hey there friends. Welcome back to the show. It’s episode 23 today about Simple Solutions, and I’m so excited that you’re here. Thank you for turning me on. I mean… that didn’t come out exactly right. Thank you for turning on this show! For listening, for giving me a little bit of your attention, which I know is a gift. How are you doing? How do you feel today? What are some of the things that are making you super excited in your life right now? What are some of the things that are kind of bugging you right now? That last question is what I want to talk about today. I like to stick to the positive. I love to find all of the good things happening in my life and feel grateful for them that keeps me going every single day and fills my life with joy and wonder and magic. And I also recognize that there are lots of issues in day to day life and sometimes they get really tricky and sometimes they’re just super annoying. So today I want to talk about finding simple solutions to some of those minor problems, annoyances that can kind of plague our lives. That definitely can take up a lot of mental energy and take up a lot of space in our schedule if we’re not controlling them and thinking about them in new ways. So that’s the topic for today’s show and I’m excited to share with you. I love my segments at the beginning. And so I wanted to start with a quick segment today. I’m going to try to keep my segments to about five to seven minutes of the beginning of the show. So if you’re not into segments and you want to skip past, you can skip ahead a few minutes. If you are into the segments. Thank you. I’m here for them, too. I love sharing little bits about life and just other kinds of odd things happening and so today’s segment is a new one that I’m introducing that is called Tiny Miracles. Tiny Miracles is just a chance for me to share some of the tiny miracles that I see happening in my life. I think that we all have these in our lives and if we aren’t paying attention to them, we might absolutely miss them. We were talking to our kids last week about the idea of looking for the ways that we see our life lining up, the ways that we see a higher power intervening or the ways that we see the things that we want manifesting themselves in our everyday life and how when we pay attention to that and we look at it and we share air express gratitude for it that we get to and notice those things even more abundantly. So my tiny miracle for last week is kind of a silly thing that has to do with my car. I had been hearing a little helicopter sound in my minivan. I drive a 10-year-old minivan that I love with all of my heart. It’s been such a great tool for our family and I noticed there was a little sound. With the age and the mileage of the car, I figured there was something going on. I needed to take it in, but I didn’t. I drove to North Carolina. I drove back. I drive my kids around the town. I had done a road trip recently up to Washington DC. I’ve done all of this driving without paying attention to that noise or making it a big enough priority that I did something about it. My tiny miracle happened when I was dropping Plum off at preschool and apparently my car gushed antifreeze, or coolant onto the driveway of the preschool, which is embarrassing. I will admit that when the preschool director called me later that day and told me she was concerned about my car because it had leaked some fluid during the Carpool line, I felt a little bit like I had wet my pants as an adult. I felt a little bit embarrassed by the, by the bad manners of my car leaking fluid in the middle of the carpool lane, but I was so grateful that she gave me that call and I thought, you know, I don’t know, maybe it was just water because the heater had been going. It was cold outside, but I decided that was kind of the last push that I needed to take it in. He said he had never seen a water pump as near to actually falling off the car as mine was. I don’t even know what a water pump is or what it does, but he explained that it’s very important part of the engine and that if it had come off while I was driving, I would have immediately lost all control. I would have had no steering, no power steering. All of the coolant would have come out of the engine and within a few minutes the engine would have seized all of that to say that angels were watching out. Acknowledge when things go right! For me, this was a tiny miracle that I had all of the pieces of this situation lineup exactly for me to get my car to the shop within who knows, you know, a couple miles of the car not being able to drive any further. I feel like it’s so important to take a moment and acknowledge when things just go so right. You could also look at this situation and say, “Well, that’s too bad. Your car broke down. You need to have it repaired and pay a lot of money to get it fixed!” But what I see when I look at this situation is that I was being watched out for this was a tiny miracle that allowed all of the pieces in my life to line up so that I could be exactly where I needed to be and be safe and have my car delivered into capable hands and have other people helping me along my way. Take a second and think about the last time in your life that you remember a tiny miracle. Maybe it happened yesterday. Maybe it happened last week. Maybe there’s something happening right now that you feel like all the pieces are lining up and the universe or the higher power or other people are helping you along your way and providing exactly what you need in your life. That my friends is a tiny miracle. I want to jump into talking about simple solutions. Now, when I say the word “solution”, that implies that there’s some sort of a problem and that is something that we all deal with every single day. We have issues or problems or obstacles that prevent us from doing the things we want to do from living the life we want to live. I want to share a really simple example as we start out of a problem that we were dealing with lately. You know that our house had a big flood in November and as the result of the demo with this flood, our upstairs bathroom has been completely taken out, so we’ve been all using the single downstairs bathroom. Now, using a single downstairs bathroom is not that big of a deal. The problem that we realized when we started using it regularly, really for the first time, my kids had been bathing in there, but no one was using the shower regularly because my kids still take baths. The shower had this really, really low pressure. You would hop into the shower and turn it on full blast and get like little tiny drips. This little baby stream of water. That was as if you were like gently watering a plant. That’s what it was like getting into the shower. Now, this was the only option in the house. There wasn’t another shower, so Dave was tolerating it. I was doing most of my showering at the gym because I could get an actual shower there. I remember thinking, “Gosh, this is so annoying.” I just had our plumber when we did the renovation of the downstairs bathroom. I had our plumber replace the shower head and all of the hardware of the shower to update it for the new bathroom. Maybe they had adjusted something wrong when they replaced that hardware to cause the water pressure to be so low because everywhere else in the house the water pressure was fine. In the upstairs shower where Dave and I would normally shower in the master bathroom, the water pressure had been amazing. It felt like standing in a tropical rainstorm in the middle of the summer. I mean, I mean I don’t know if that’s actually a thing that the tropical rainstorm would be a great shower, but in my head it would be. And that’s the kind of like full blast, warm, steamy shower that I like to take. The plumber replied and said, “I can have someone there in a couple of hours.” So someone came over a couple of hours later, they unscrewed the shower head. They found a little filter, a little piece of packaging that hadn’t been taken out properly. They screwed the showerhead back on. Thirty seconds later, the shower was operating at full pressure, full heat like that beautiful torrential rain forest, downpour it that we all want to take a shower. It had been as simple as that. Problems are almost always bigger in our head than in real life. Now you might be thinking this is a really silly example of a problem because maybe taking a low pressure shower isn’t that big of a deal. And in fact, in the grand scheme of things, no, it’s not that big of a deal, but I love the illustration of a problem that I had that it took me weeks and weeks of thinking about and feeling frustrated about and feeling kind of emotionally drained by and telling myself a story about the way that it was going to be a big deal to get it solved. And then what happened when I asked myself the simple question, “If this was easy, what would it look like?”And then I followed a couple simple steps. I recognized what are the resources that I have right now that could help me. And the first thing that popped to mind was that I am on a first name texting basis with a plumber. I don’t even have to go to the work of looking for a plumber. I’ve got one in my phone. And then I asked myself the question, what resources do I need? Well, I need someone who knows how to fix the shower head. And then I asked myself the question, what is the very first step? What is the very first action that I can take to lead us to solving this problem? And when I did that, the very first action was to text the plumber and then he responded and then the solution rolled itself out within a couple hours. It was so easy and so simple and we suffered (I’m using that term very lightly here)…we suffered through annoying showers for over a month because I didn’t ask myself how to find a simple solution to this problem. Think about your own little problems. I want you to think about your own life right now. Are there any things like that? Little annoyances, little problems that are kind of dragging on your mind, that are weighing you down a little bit, simple problems that very likely have simple solutions that you just haven’t acted on yet. Think about one of those are a couple of those. Get a couple in your head and I want to walk through this process with you of how to find a simple solution for your problem. So often the reason that we do not find solutions for our problems is because of the stories that we tell ourself about the problem. In fact, a lot of the time when we’re thinking about obstacles or problems or challenges in our life, we’re not even thinking about the way that we might overcome them. We’re just rolling around a little bit and how frustrating it feels to have the problem in the first place. If we don’t find solutions for some of these little problems over time, we will find that our life has collected a bunch of minor annoyances, a bunch of tiny challenges that actually weigh us down and drain our energy every single day. I propose that you put in place a system of maintenance so that your simple problems can regularly be solved with simple solutions so that you keep your headspace clear and keep your energy high and focused on the things that actually matter more than the pressure in your shower. I want to walk you through this process by sharing an example of another problem, and while I’m walking through the steps, you can think of one of these for you, a problem that you might have that you want to find a simple solution. For now, I will say that a simple solution doesn’t always mean that it’s going to be super fast or super easy or free. Sometimes the solutions will involve some level of investment and resources and time and energy, but I have found that the solutions generally are way, way easier and way, way less draining than the consistent feeling of the problem, or the consistent pressure of having things undone or having things not solved. The system for finding a simple solution. As I share this next example, I want you to be thinking about your obstacle or challenge or problem at the same time and we’ll walk through the steps together. 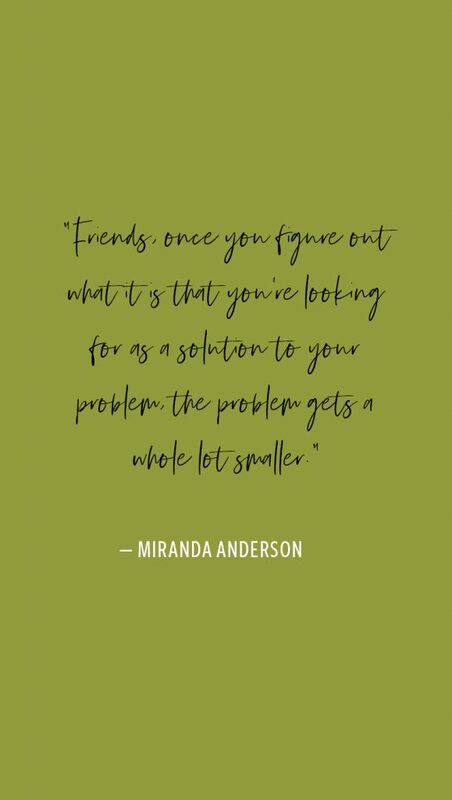 Now your problem may look very, very different from mine, but I’m going to suggest that a lot of the questions and the process for solving the problem for finding a simple solution will be similar. When Dave and I moved to Austin, Texas, I had a four-year-old, a two-year-old, and I was pregnant with my daughter. We quickly found a lot that we fell in love with and decided that we wanted to build our own home. So we started the process of designing and choosing things for our home. At the same time I was working as a nurse. I was a injection training specialist for a pharmaceutical company and so I was seeing patients all over the central Texas area driving to their homes to do appointments. Balancing being a mom, being pregnant, building a home, moving to a new place and working at a new job was a lot and I felt overwhelmed frequently. Way beyond the normal tired, sick feeling that I have when I’m pregnant. I was just worn out and I felt like I wasn’t able to find time for the things that I wanted to do. I was rushed everywhere I was going. I was feeling like I was spending a lot of time with the kids without a lot of intention because I was trying to do other things at the same time and it was really frustrating. I was quite emotional about it and I remember telling Dave that I needed to find some support. I needed to find some sort of system or community because I needed help with the kids and I needed time to myself and he was working a new job and we had just moved to this new place, so I didn’t really know anyone very well yet and even the people that I did know, I didn’t know well enough to consistently ask for them to help with my kids, so I was in the middle of this problem. I was a little guilt ridden because I wanted to find a childcare solution that would work sometimes, but I didn’t need it to be consistent like a daycare or a preschool. It was the middle of the summer and so no one was doing preschool anyway. I just kept feeling like there was no solution. I didn’t know what to do. I didn’t know how to feel better. I didn’t know how to have my kids taken care of well and I kept just turning it over and over in my head and feeling bad for myself, feeling lonely, feeling like we didn’t have a community. I telling Dave that things had been so much easier before we moved because we had neighbors and good friends and I hadn’t really had to deal with not having help with the kids when I needed it. It was a tricky thing. 1. Ask the simple question: What are you looking for? What is the solution you need? Dave asked me a simple question, what are you looking for? What is the solution that you would like to have in this particular situation? And I said, I wish there was somewhere that I could just drop my kids off without an appointment when I need to. That wasn’t so expensive that I couldn’t afford it, but there wasn’t regular or full time. It was just wonderful, happy childcare when I needed it. Dave asking me the question, what solution would you like or what solution do you need right now? Was essentially him asking me the question, if this was easy, what would it look like? I had to first figure out what I wanted because I was spinning around and around wondering why I couldn’t find something to make me feel better, but I hadn’t yet identified what it was that I was looking for. 2. What resources do you have? What resources do you need? Who has them? Next, Dave went to the step of what resources do we have? Well, the resource that we have that was most useful in that moment was the internet. He could look up through a google search, what types of childcare facilities existed in our new neighborhood. We didn’t know anyone that was using this type of childcare and so we could look up and find out what existed, what was available, how much it costs, what the hours were, and what all of the programming looked like. The other question that became really important right then was similar to the first, what resources do I need? I needed somewhere that I could take the kids at short notice somewhere that was happy and safe, that they would enjoy spending time where I would feel good about having them spend time, and the third question was, who has that resource? Who is the person or the company or the book or whatever the case may be that will provide the resource that we need. In this example through identifying what our need was and searching it using our resource. Dave was able to find a drop in child care situation that was a couple miles from our house. It had really wonderful programming. Snacks and lunch were provided. If your kids were there during the snack and lunch times, they did activities, hands on crafts. There was a game and dress up center. It was exactly what we needed that– until we identified what we needed– we hadn’t even been looking for. 3. Act! Take the first step. The last step was the most wonderful. I just had to act. I put the boys in the car. I drove them over. I walked into the facility and signed them up. That very first day they were a little bit nervous because this was new for them too, so I waited and watched behind the glass as they met a couple new friends and soon we’re just running around with all the other kids putting on dress ups and playing with the toys. I went back to my car and sat down and just cried for the simple solution that had existed the whole time that I had been feeling so drained and so exhausted, so guilty and so frustrated. It was so easy and all we had to do was find it. In case you didn’t catch it, let me go over the steps to finding a simple solution to many, many of your simple obstacles and annoying problems in your life. The very first thing to do is to ask yourself the question, what would this look like if it was easy? Another way to ask that question is, what solution am I looking for? What exactly do I need? The next step is to ask yourself the question, what resources do I have available to me right now? Maybe your resource is just your phone and the Internet. Maybe you can think of a friend who would know better than you do like the phone, a friend on a game show who was the friend who has the resources that you need, so think to yourself, what resources do I have that maybe time it may be money. It may be information and maybe people on your contact list? What resources do you have that you can employ? And then that leads us to the next question. And then ask yourself, who is the person if it’s not me, who was the person that has the resources that I need? And then you take the very first step. You have to act. Like when I was standing for over a month in this tiny trickling, freezing cold shower thinking that I shouldn’t call the plumber because he was going to be here anyway soon and it was probably going to be a really big fix and I want to just add it to the invoice for everything else he was going to do in the house. I was telling myself all of the reasons that this very, very simple solution of call the plumber and have him fix it within two minutes for free wouldn’t work. I was talking myself out of literally the most simple, basic, obvious solution because of all of the stories that I was inventing my mind about what would happen. This is one very last example that I want to share with you. It’s another kind of dumb one and you guys probably have way more problems that I’m sharing right here. Some of them may be personal, some of them. Maybe just little things like annoying things like you walk past something that stuck to the wall in your house for weeks and weeks and you don’t just stop and fix it or that your kids keep putting all of their legos in the wrong bin, so just switch the bins. Some of those things are really, really easy and obvious and that you can like hop very quickly to the act section. But here’s another just random example in case it jogs your ideas about the ways that you could use this technique for finding simple solutions in your own life. Another example of a simple problem with a simple solution. The other day, this is where my car comes back into play. The other day I noticed that my car needed an oil change because of the little sticker that was up on my windshield. That’s so nice of them to give me a sticker to remind me to take it back in. I was about two or 3000 miles over my sticker, which is not unusual for me. I drive a lot. I love to drive and so I’m never feeling sad about a road trip, but I was getting to the point that I wanted to get it done fairly quickly. I wanted an oil change today. That’s another thing I guess you could know about me. I’m a little bit impatient when it comes to finding solutions. If something feels like it’s going to take a long time, I don’t really want to do it. I just put it off, which is dumb because the longer you put it off, the longer it’s gonna take all of that to say I needed an oil change and I called a couple places that I normally had taken it and they had appointments for the following week or for several days down the road. I wanted to get my oil change right now. Maybe this is a really, really silly example, but I think at least it’s relatable. I remembered when I asked myself the question that I had a punch card in my wallet from an oil change place that I had taken the car over a year ago. It was another day just like this one where I wanted an oil change quickly and I happened to buy a place with a big oil change sign and so I just pulled in and they were able to take my car. I pulled out this punch card that for whatever reason was still in my wallet and I looked up the number on the front and I gave them a call. So on the card in my wallet, I had the resource that I needed this company that could take my car right then and on the card I also had the address so I just plugged it into Google maps and I drove over and I took my car in to have the oil changed. I sat in the waiting room and worked on the manuscript for my book while they changed the air filters and change the oil and I asked for a new windshield wiper blade because the driver’s side one was getting kind of ratty and I couldn’t see very well when I was driving in the rain. So I had them fixed that. It was like a three for one. That was it. I mean this kind of annoying problem had a very simple solution and I had all of the resources right in my wallet that I needed to take care of it. Easy Peasy Simple Solution System! Maybe as I’ve been talking, you’ve been able to think of your own life and some simple little annoying challenges that you are facing or maybe sometimes like what I was experiencing in Texas with my childcare didn’t feel simple and an annoying challenge. It felt like a really big, lonely emotional problem and I really needed help and I needed a solution, but I didn’t have a system in place for helping me figure out what that was, so that’s what I want this podcast to inspire for you. Even if some of these problems that you face are going to take a little more time, a little more energy, a little more investment. I want you to at least leave listening today with a framework for how to get started. Finding the simple solution. And then fourth, ask yourself, “Who has those resources that I need? Who is the right person to help me? After you get all of those questions answered, you will have a very good idea of what solution you’re looking for, and then you have to take the final step, which is actually the very first real step. You have to do the first thing that’s going to lead you down the path of actually solving your problem. Maybe the first step is going to the Internet and looking up who has the resources that I need. Maybe it might be going to the Internet and asking what type of solution would be simple. 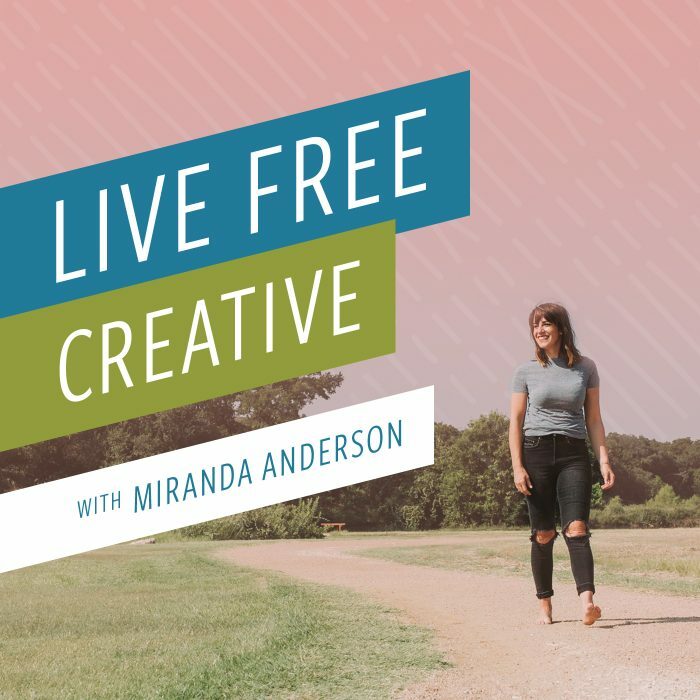 I hope that listening to this episode has given you some insight on some of the little things that are glitchy and your life that you could do a quick, easy, simple solution for. And that that as you add those up, solving all of these little mini problems and consistently conducting a maintenance over your life so that you don’t have a lot of problems constantly draining on your mind and on your energy, you’re going to feel so much better. In fact, it’s so fun. The very first time that you do this, you think, “What is the best simple way to solve this problem? Or if this was really easy, what would it look like?” And the answer pops into your head and you’ve never actually thought of it before. You’ve been going over and over and over this problem for weeks and you ask yourself, what would this look like if it were easy? And all of the sudden you know exactly what you need to do! I’m so excited to hear from you. If you are able to use this, these steps for simple solutions in your own life, I’d love to hear. I think we’re all in this. Sometimes our head is so down deep in the sand, going through the rigors of our daily life that we’re not looking for all of the resources that are readily available around us to help our lives have a little bit easier time, so cheers to very simple solutions to all of life’s little problems. As always, I want to thank you so much for being here. It means so much to me that you take the time to listen to the show. I hope that the things that you’re learning are adding value to your everyday life, that you are learning something that helps you feel a little bit better, feel a little more creative, feel a little more intentional and feel a little bit more free. If you haven’t yet shared about this podcast with any of your friends or family, I would invite you to do that. What’s holding you back? Also, I would love for you to go over to apple and leave a rating and a review. The rating is the star system so you can check the stars that you want to leave for the show and a review really makes a huge impact when you leave a review and you share with other people how you feel about the show. It not only helps other people find out if this is something that they would like listening to, but at bumps the whole show up in apple’s rankings, so even more people might be able to find it. My goal is for as many people as possible to be able to listen to these messages in hopes that they inspire them to live a little bit more freely, the life that they really love, and I could really use your help with that as you share ratings, reviews, and just screenshot and share the show with whoever, whenever, wherever. I will take it. Thanks so much again. I hope you have a wonderful week and I’ll talk to you next time.